While today is the feast of Sts. Cyrus and John the Unmercenary Healers, I am not really going to blog much about them. I do love them and have a great affinity towards Alexandria, where they were martyred; however, in terms of RPGs the only thing that I can think of to write about is the fact that one of the reasons the original cleric, which was in part modeled after Christianity, has spells like Cure Lights Wounds, Neutralize Poison and Cure Disease is likely because of these saints and those like them. 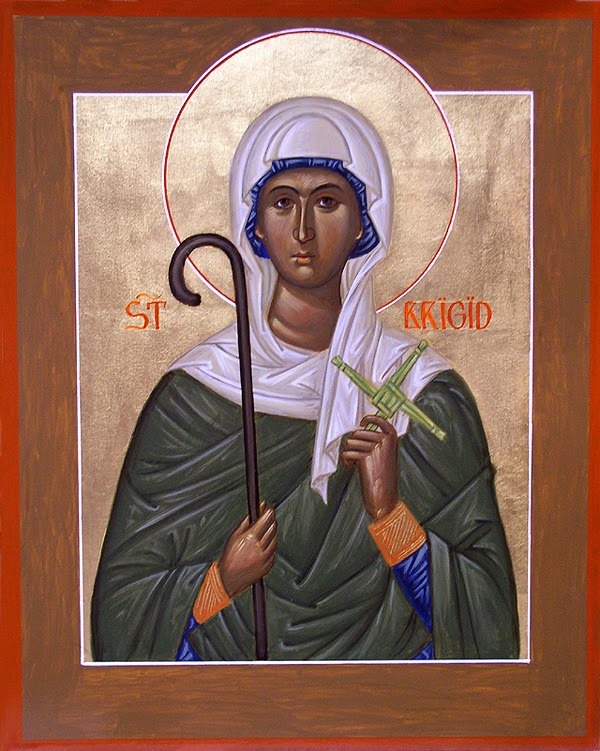 While potentially interesting, I have found myself drawn to St. Brigid of Kildare this week. Though her feast isn’t until tomorrow, her life has me itching to start drawing maps. St. Brigid was born around A.D. 450, the daughter of a slave and her master. She was baptized by St. Patrick, Enlightener of Ireland and they were life-long friends. Due to her generosity to the poor, her father found her to be too expensive to keep as a slave and was set free. Afterwards, she was the founder of women’s cenobitic monasticism in Ireland and is considered to be one of the patron saints of Ireland along with St. Patrick. The monastery that she established was on a piece of land given to her by the King of Leinster and called Cill Dara (now known as Kildare). Translated, the name means “church of the oak.” It was in the midst of an oak forest and was built from oaken timber. There are a lot of stories from the various hagiographies of St. Brigid, but one of my favorites is of the blind nun Dara. One evening, the two sat and talked. Losing track of time, they found that their conversation had lasted the whole night and it was dawn. St. Brigid was astonished at the beauty of the morning light on the dew of the flowers in the field in front of her and longed for Dara to be able to see it all. Praying to God, she made the sign of the cross and Dara could see. Although she did find the morning scene to be quite beautiful, she asked St. Brigid to pray for her blindness to return, explaining, “for when the world is visible to the eyes, then God is seen less clearly by the soul.” St. Brigid prayed, and Dara was blind once again. Interestingly, St. Brigid herself had only one eye because she plucked the one out in defiance of a suitor who was enamored with her beauty. She died in A.D. 523. The RPG part of my brain has been gleefully chewing on the name “Cill Dara” and the story of Dara the blind nun all week. The fruit of that endeavor is an adventure locale akin to the Monastery of the Unsleeping Ones. The Monastery of the Oak is literally a giant oak tree with a door in it. At one time, it was inhabited and cared for by an entire community of blind nuns. What is not generally known is that the oak actually sits atop a rift in time/space which allows all kinds of nasty things to come crawling into the world. It is also not widely known that the nuns actually lived inside the oak. When a normal adventuring party opens the door of the giant oak tree, they will see a set of stairs going down. These lead to a section of your favorite megadungeon teeming with all kinds of monster badness. If, however, any member of the party is blind, blindfolded or otherwise cannot use their eyes to see, there are no stairs down, but rather a gate leading into the main grounds of a monastery which can only be “seen” by those who cannot use their eyes. If the monastery is successfully entered and those who enter it begin to pray, the tear in time/space is closed. Thus, anyone entering the oak sans blindness or a blindfold would simply see the empty shell of an oak trunk. How and why the blind nuns no longer pray 24/7 to keep the tear closed is part of the mystery a party might stumble upon while exploring the dungeon and the monastery. My only access to 5e is the Basic Rules, because I cannot afford to invest anything other than free in my gaming for the foreseeable future. As this community has demonstrated from its outset, there is value in examining a rule-set on its own. We have examined 0e, Holmes, B/X, 1e etc. and found a number of wonderful, unexpected treasures buried inside those rule sets. We’ve also found a number of things we’d rather not use. Yesterday, I got several comments that deserve a response. Due to the wide breadth of these comments, I am going to do an entire blog post. Firstly, my biggest beef with 5eBR is that as a stand-alone product, it is unusable. There is no treasure table. There is no advice in the DMs section on awarding XP, except a table in the Building Combat Encounters section. That means, as is, combat is the only way to earn XP. Certainly, I can hack away and use treasure and XP tables from another edition, but I really didn’t want to have to do that in order to play. Even though limited to 1st-3rd levels, both Holmes’ and Moldvay’s Basic Editions are playable without using any other outside material. Advantage/Disadvantage — this is such an elegant mechanic that so simply deals with a huge swath of situations where a ±1 to ±4 just never felt right. Backgrounds — anything that can enrich the story of a 1st level character with randomized goodness, a couple of non-combat areas of expertise, NPC contacts and some equipment that one might not otherwise bother buying is right up my alley. Thirdly, while I do understand and accept that there are other useful models for granting XP, reading 5eBR reminded me how awesome Arneson’s 1 XP = 1 gp spent really is. As anyone who has read this blog long enough knows, one of the things I value most in my RPGs is freedom. While combat-only is a legitimate choice for awarding XP, it does so at the cost of player freedom and, at least in context of how much a goblin is worth and how fast the XP progression is in 5eBR, my own ability to suspend my disbelief. Player freedom goes out the window, because the only way a mage can become second level is to go out and fight things. IF Arneson’s XP model is used, that very same mage has a huge variety of choices as to how to get to second level. The mage could go and find a goblin army to kill, but a more interesting choice is to make off with the army’s supply caravan or to run off with the treasure hoard of the evil mage paying the goblin army. To boot, the 1 XP = 1 gp formula puts the development of the character directly in the hands of players. How a player spends that money in order to become second level defines who that character is even more than class mechanics. That same mage could spend money by bar hopping across your favorite FRPG city or by buying access to a private collection of scrolls. Each choice says far more about the character than his/her spell book does. I have also found that when players are having to find ways to dump thousands of gold pieces, the easiest way to do so is to invest in and build stuff. Players suddenly have far more of a vested interest in the health and safety of a community/locale when this kind of spending happens. Thus, external threats become much more personal and adventures have higher stakes. Fourthly, while professional armies were a new thing during the Hundred Years War, the largest expense of the Crown was equipment not wages. And if, as is the tradition in FRPGs like D&D, one relies on literary source material, according to Shakespeare, Henry V had a close personal friend hung for stealing from the conquered French. Thus, the actual amount of cash an average commoner would get from a 6-month contract wouldn’t likely be enough to be able to advance to second level. Which goes to show that this scenario is a lot easier to justify using older editions than trying to justify how anyone, let alone an officer, in an army could only be 1st level using 5eBR. Finally, when it comes to game mechanics, I don’t buy into systems that treat PCs differently than the rest of the world. Suspension of disbelief plays a large part in this, because such a mechanic is antithetical to the world view of my faith. Christ gave eternal life to all of humanity when He went to the cross and rose from the dead. The crux of our life is what we do with that gift. Practically, it means that anyone can do great things. If a game does not allow Joe Nobody to defeat Mr. Big Bad Guy with a good plan and good luck, then my suspension of disbelief is out the window, because I know the stories of thousands of Joe Nobodies who did do great and wondrous things. PLEASE NOTE: As of now, all my musings on 5e are going to be about the Basic Rules (which I will refer to as 5eBR from now on). When one has a child in the hospital for the better part of a year, one’s gaming budget is Free. I have no ability anytime in the near future to actually purchase any of the core rulebooks. I may never do so. I really want to like 5eBR. I really do. It is a really good hack of D&D and there are several interesting ideas that I will be hacking into my own hacked version of D&D. Unfortunately, I cannot bring myself to like 5eBR as is. It all comes down to a theatrical concept called suspension of disbelief. When putting on a theatrical production, it is critical that the world presented have some kind of internal logic so that when presented with things such as the Battle of Agincourt from Shakespeare’s Henry V— something that could never happen within the confines of a theatre stage — the audience can easily immerse themselves in that world. They suspend their disbelief that the battle can’t occur on stage. RPGs operate in a similar fashion. Everyone who plays D&D, for example, should know that the world presented defies all kinds of economic, physical and social logic. However, the rules do such a good job of representing a fantasy world in the abstract that we have successfully suspended our disbelief for decades. Upon reflection, the moment I knew I didn’t like 3.5 was the moment my suspension of disbelief was shattered. Our party stumbled upon a machine that was built/controlled by the bad guys. It was a giant clock work of gears. We wanted to literally throw a wrench into the works; however, we did not have a rogue and the gear system was the equivalent of a DC25 trap. No matter what our party did, no matter how logical, no matter that it would work in the real world no one in our party could stop those gears from turning. I could no longer immerse myself in the world and I found, rather, that I was just seeing how illogical and silly it all was. When the DM section of 5eBR was released, I decided to “play” the game the only way I could: stock a dungeon and see how it compared to the editions I like to play. I quickly realized that I couldn’t. There are no treasure tables. I then realized why WotC would be so lazy as to not include any: all XP comes from combat. Treasure is largely irrelevant. This seriously challenges my ability to suspend disbelief: in order to become a better mage, cleric or thief you have to go kill stuff. The world presented isn’t a world where adventurers explore ruins from lost civilizations. Rather, it is a murder world where prowess in combat is everything. I suppose if you wanted to run a campaign inspired by Glen Cook’s The Black Company this would be okay, but this certainly isn’t the game I played as a kid. What really threw my suspension of disbelief out the window was the combination of XP progression and the amount of XP given per kill. I have no real issue with fast XP progressions, especially in context of not having the kind of time necessary to take a character from 1st to 9th level (something I never did using older rule sets). Personally, this really never bothered me because my favorite “tier” of play is 1st-3rd; however, I could see how shortening the XP progression could be a very good thing. Having said that, the world 5eBR presents completely breaks down when considering the amount of XP given per combat kill. A measly little goblin is worth 50 XP, a bandit 25 XP and a commoner 10 XP. At 300 XP to get to 2nd level, it would take 6 goblins, 12 bandits or 30 commoners to advance. This defies logic, because those kinds of numbers should be achievable through basic training — especially in a murder world where even scholarly mages need to kill things to be a better mage. This is rendered even less logical when one realizes that Soldier is one of the backgrounds available to 1st level characters. A professional soldier in a world where combat is a constant should be plowing through the equivalent of 6 goblins almost every day during training, let alone if one actually participated in some kind of military campaign. Add to that the idea a 1st level character could be an officer and the 5eBR world just spirals off into the ridiculous. I suppose that if the average age of a 5eBR 1st level character were, say, eight I might be able to accept all of the above, but I don’t really get off on imaging a character as an eight year old kid who is forced to murder things in order to get by. For me, this all highlights the genius of Arneson’s 1 XP = 1 gp spent. Regardless of the world in which such a scheme exists, the main impetus for characters to advance from 1st to 2nd level is getting enough cash to invest in themselves — whether through better equipment, better henchman, tithing to a church, a down payment on a house, etc. Thus, each character can become a renaissance man (woman) in their own unique way and believably face down tougher and tougher monsters and win. It also becomes believable that an army of commoners will still be commoners after a series of battles. When treasure spent is the main way one gets to 2nd level (because otherwise someone would have to kill 100+ goblins), war is no longer the main way a bunch of normal joes can become high-powered adventurers. Only folks willing to explore ruins, lost civilizations and dungeons to bring back treasure get to do that. Today is the Feast of St. Gerasimus the Bishop of Perm, which is both a city and an area in central Russia at the base of the Urals, where Asia and Europe meet. It is the traditional home of the Zyryani or Zyrian people (today, they are called Komi). St. Gerasimus was elected sometime after 1416 and was the third bishop of this newly Christianized people. During his bishopric, he took part in local councils. One dealt with the structure of the Russian Church and one rejected union with Rome as advocated by Isidore, Metropolitan of Kiev. The villages of the Zyrian people were also frequently raided by Novgorodians (who had their own Republic at the time). These raids were primarily carried out by a pagan tribe known as the Voguls. St. Gerasimus was extremely diligent in caring for his flock, going so far as to condemn the raids and travel in Vogul territory urging them to cease their violence. He was murdered by a Vogul in 1441. Tradition holds that he was strangled with his own omophorion (part of the bishop’s vestments which go around his shoulders). There is a meme among those of us who play fantasy RPGs which champions campaign worlds that don’t feel like traditional high fantasy and/or medieval Western Europe. Personally, I like my campaigns to be a healthy mixture of the familiar with the alien. The familiar elements help players immerse themselves in the world, while the alien elements help bring a sense of wonder and a need for exploration. The See of Greater Perm at the time of St. Gerasimus is an excellent example as source material for this kind of campaign. While still ostensibly European in character, its proximity to Asia (especially a fantasy analog) justifies PC classes like monks and any others that one might port over from your favorite Asian-flavored rule set (mine would be Ruins & Ronin) as well as all kinds of cool monsters. Politically, Perm is a keep on the borderland between the Far Eastern reaches of European Civilization and the Asian Wilderness. The Europeans have an ongoing political conflict between the power hungry Novgorod Republic, the more traditional power of Kiev and the upstarts of Moscow. (Given the raids by Novgorod and St. Gerasimus' rejection of the Kiev move to ally with Rome, it would seem that Perm-as-Keep on the Borderland would be a Muscovite endeavor). The Republic is comfortable with assimilating (pagan) nomadic tribes from Asia in order to expand their territory. This could be interpreted as having a number of non-human and non-Lawful allies, which could very well complicate matters for PCs as they come into conflict with non-human adversaries. The modern name for the Zyrian peoples is Komi, which can be translated as River People. This justifies re-skinning magic to be more water/river based. Cure Light Wounds, for example, could be understood to be the application of Holy Water to a wound. Given that Perm is around the same Latitude as Juneau Alaska, the theme of Heat vs. Cold or Fire vs. Ice could also color the traditional Law (Civilization) vs. Chaos (Wilderness) dichotomy. The coat of arms of Perm includes a bear, which suggests that (polar) were-bears play a large role in the campaign. Beast Friendship: frost elves gain a +2 reaction with wild animals, may take them as henchmen and can identify flora and fauna with a roll of 1-3 on a d6. Frost elves fight as fighters, may use any weapon and can wear chain or lighter armor plus shields. Several months ago, I tried to start posting to this blog again. Shortly thereafter, my daughter’s health took a dramatic turn for the worse. She is still in the hospital, having had almost a dozen major surgeries and been a razor’s edge away from being declared brain dead. Only by the grace of God is she still with us and there is actually an end in sight to this whole chapter of our life. Thus, gaming and thinking about gaming haven’t been on my radar, let alone blogging about gaming. I do plan, however, to get back to some sort of routine here in this little corner of the internet, because I miss it, and (most importantly) I miss the people who inhabit this little corner. Therefore, I’d like to take a moment to thank everyone who has sent prayers, warm thoughts or just generally missed my musings. All have helped me get through this past year. I hope that those who know this blog and know me are neither surprised nor offended that I must also give great thanks to God for all that He has done for me and my family this past year. I am looking forward to being here more often in the near future. Godspeed.